Photo by Jay Mallin, United Methodist Board of Church and Society. The Rev. John McCullough, a United Methodist and president and CEO of Church World Service, was among faith leaders arrested in immigration deportation protest. Luis Orellana, a United Methodist from Des Moines, Iowa, has seen people disappear. It’s the result of people he knows being deported against their will, often breaking apart marriages, families and whole neighborhoods. He was in Washington July 31, to join with hundreds of protesters calling on President Barack Obama to end what they view as inhumane immigration enforcement policies. 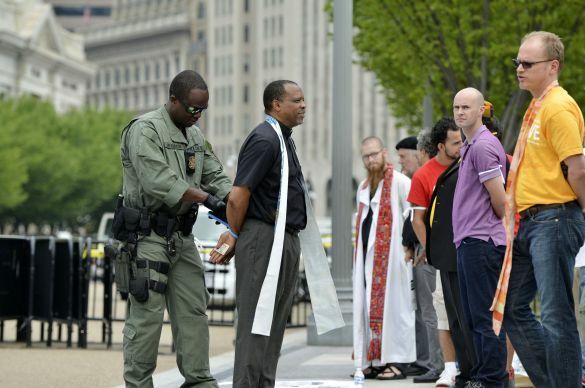 All told, 112 faith leaders, including 45 United Methodists, and advocates were arrested in front of the White House during the demonstration that demanded more humane immigration and deportation policies from the Obama Administration. United Methodist bishops Minerva Carcaño of the Los Angeles Area and Jack Meadors, retired, were among those arrested. The day started with prayer for more than 100 faith leaders, including United Methodists, and immigrant activists who had a strong message for President Barack Obama: Save the children, no more deportations. Under warm, sunny skies, protesters marched from Lafayette Park to the fence line of the White House, demanding an end to the massive deportations President Obama had overseen during his time in office. Reports indicate that about 1,100 people are deported from the United States every day. One by one, they were arrested by U.S. Park Police and loaded into waiting buses and vans for their act of civil disobedience.Those arrested were expected to be released after paying a fine. Support from across the U.S.
Orellana and 11 other United Methodists from Iowa drove 22 hours one way to get to Washington, all to lend their voices to the cause. Kaija Carter, 17, part of the Iowa group, was at her very first demonstration. She has witnessed friends and family being deported. Because she is a minor, Carter couldn’t join the others in being arrested. But that doesn’t mean she’s not passionate about the issue. “This is just the beginning of my social justice work and activism,” she said. Janelle Mueller, from Trinity Las Americas United Methodist Church in Des Moines, works with children at a social service agency within the church. She has watched for the last 15 to 20 years as families have been torn apart by deportation. In the current immigration crisis — with children from Honduras, Nicaragua and other Central American countries pouring over the border from Mexico to the United States — Carcaño stressed that “we must not allow this government to deport these unaccompanied children, sending them back to the possibility of violence upon their own lives: the violence of poverty, of gangs, of gang cartels. Are we not a nation of justice? The shame is that we are not living that justice at the moment. The Rev. Susan Henry-Crowe, top executive of the United Board of Church and Society, was at the rally, but was not one of the people arrested. She was there, she said, to support the work of the church in its efforts to stop deportations. Henry-Crowe said that her agency would be posting resources for United Methodists to use on this issue on its website. “Certainly, we can pray and help others understand the issue,” she said. She also urged people to support Justice For Our Neighbors, a church-based legal clinic that is seeking to offer support and assistance to some of the children who have recently crossed in to the United States. The Rev. Eric Folkerth, senior pastor at Northaven United Methodist Church in Dallas, and the Rev. Owen Ross, pastor of Christ’s Foundry United Methodist Mission in Dallas, attended the rally and were part of those who were arrested. “I’ve seen children living in fear of parents being taken away from them,” said Ross, whose mission serves an immigrant population. “I’ve seen families torn apart at a moment’s notice. I’m here today to say that our nation needs to stop terrorizing its immigrant population. Northaven United Methodist Church, Folkerth said, is a big supporter of Christ’s Foundry. He accompanied Ross to Washington not only to attend the rally, but also to meet with lawmakers on Capitol Hill. Folkerth called for an increase of compassion. See what others were saying about the July 31 protest on RethinkChurch. Alsgaard is managing editor of the UMConnection in the United Methodist Baltimore-Washington Annual (regional) Conference. News media contact: Kathy L. Gilbert, Nashville, Tenn., 615) 742-5470 or newsdesk@umcom.org.